History:The presiding deity is a gold idol in standing posture. The Bangaru kamakshi idol in Thanjavur was originally in the kamakshi temple at Kanchi. The idol of Goddess Sri Kamakshi made of solid gold was shifted from Kanchipuram main shrine (Kanchi Sri kamakshi Amman Temple) in order to protect from the Mugal iinvasion. Due to the invasion of Kanchi by hostile powers, sankaracharya Shri Chandrashekara saraswathy IV of the kanchi kamakoti peetam shifted the idol to Udayarpalyam and later to Tanjore. The idol was wrapped with cloth and the shiny surface was smeared by black punugu (secretion of the civet cat) covered with a cloth and smuggled out in a palanquinas as if it was a child with small pox while shifting from kanchi to Tanjore and it has been re installed at tanjore. Even today the idol is routinely smeared withpunugu and appears black. During annual navarathri abhishekams also it does not wash off!! The herbs (Punugu) applied on the idol gives out a stunning appearance of Goddess Sri Kamashi black in colour. 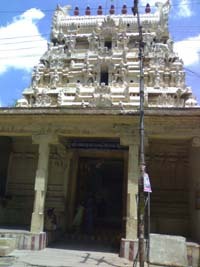 Next door to this temple is the navaneetha krishna temple with krishna rukmini sathyabhama and kodhai. Festivals: Panguni Uthiram ,Navaratri, thiru Karthikai, Masi Makam, Vaikasi Visakam, Adi Pooram. TempleTiming: This temple remains open from 6.00 AM to 12.00PM in the morning and 4.00PM to 9.00PM in the evening.